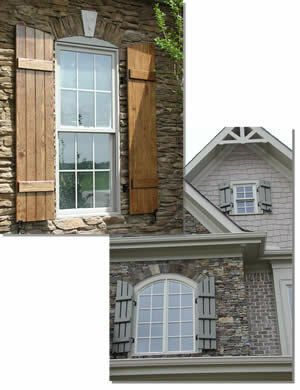 Standard and Heavy-duty Board and Batten window shutters are of exceptional value and beauty. Our custom exterior all-wood shutters add enduring character to new or updated structures. Made from high quality Select Grade lumber or composite. We feature open and closed style shutters to match your home's style. All of our Board and Batten shutters are primed before assembly as a FREE Upgrade option. This allows us to cover all the shutter's surfaces to prevent future damage from weather deterioration. Our standard shutters feature an open and closed style shutter with the option of adding a "Z" bar for accent. Vertical boards and battens are beveled. Battens end a quarter inch from the edges of the boards. Third battens are recommended for open weave styles. See the styles below. These shutters are custom manufactured to the quarter inch. So they compliment standard and unique window sizes. You can easily order to suit your needs via our online shoping cart. View examples in our Image Gallery. Free shipping on all shutter sizes less than 76"
Vertical Boards are compressed together. Polyurethane glue is then applied to the back of the batts. Batts are attached with a minimum of three screws per board at the batt. Screws are inserted from the back so as not to show. Result is a minimum of 18 screws per panel for long life. Battens are placed 7" from the top and bottom of the shutters, or 5" if the shutter is a small size. A third batten is recommended for wood shutters taller than 51". We pre-prime all board and batten shutters as a FREE option. This allows for the protection of all the wood surface. We do not prime, if you request the stain-grade finish.